PCI DSS : What is PCI DSS? PCI DSS is a cryptic abbreviation for a major requirement of e-commerce. Even if you ran your own credit card processing system, you would be forgiven for wondering "What is PCI DSS?" Here we explain the requirement from its genesis. The abbreviation PCI stands for the payment card industry. DSS stands for the data security standard that any trading entity who handles credit card information must meet. Put together, it is the "Payment Card Industry Data Security Standard." The Payment Card Industry Security Standards Council (PCI SSC) was formed in 2006 to create a standard for handling credit card payments so as to reduce fraud. The PCI SSC issued version 1.2.1 of its security standard in August 2009. Then in October 2010, version 2.0 was released. The various versions have added to the requirements of the standard as well as clarifying what is intended by the various checkpoints. Contrary to popular myth, most identity theft does not involve credit card fraud but is done for unrelated benefits (e.g., social security, welfare, etc.). The data security standard was widely received as more of a bane than a boon by merchants, even though it was meant to mitigate against charge backs and false charges. As small as the percentage is, the increase in credit card usage means that the losses are actually increasing as new markets open, countries develop, and the credit card industry grows with it. 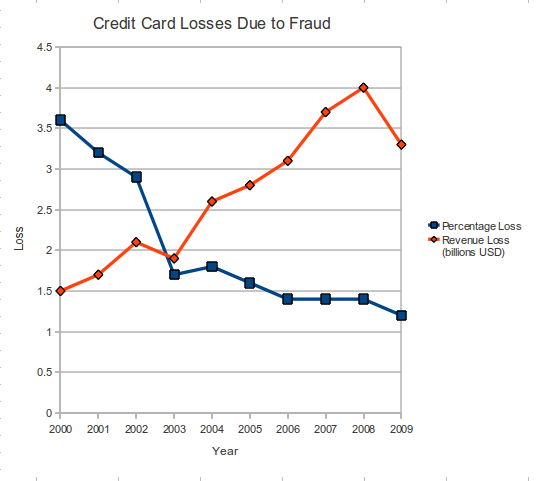 Below is a charting of credit card fraud losses relevant to the industry's scale. One can readily see the need for a data security standard for the payment card industry. The discussion goes on as to whether the DSS has actually been a help or a hinderance. Many in the credit card industry say it has been a help because of the downward trend in percentage instances seen here. However, many merchants find the cost of PCI DSS requirements to be onerous. See more on PCI security standards and training.